We’d love your help. Let us know what’s wrong with this preview of Tryst by Shaniel Watson. 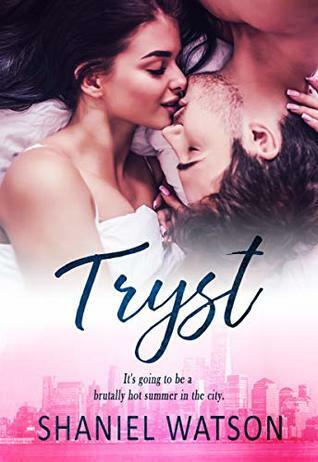 I never expected to like Tryst as much as I did! The characters were what drew me in, and their instant chemistry is what kept me reading the entire time. Shaniel paints a quick and steam filled story of Jade, a soon-to-be senior in College at UCLA, and Ian, a alpha-male who is instantly captivated by the woman Jade has grown up to be. There is just a small problem though--He is her father's best friend...and her new boss for the summer. I'm not usually one for Taboo stories, but I'd be lying if I said I didn't like this one. Initially, I thought I wouldn't like this book solely because I thought the age gap was gonna be HUGE (18 year difference); but Shaniel handled this in such a way that I didn't mind it at all, but rather, I found it refreshing and different from what I normally read. This is definitely a nice break from the usual angst and deep romances that exist in the amazing world of books that I love. This is an incredibly quick read-maybe an hour or two if you have some time, I would recommend spending time with the characters in this book. It’s an extremely fast paced book that really ends up being a fortunate sequence of events. It’s a lot of intertwined characters, being related- but I really enjoyed every second. I think some may say the story is taboo, but it was d This is definitely a nice break from the usual angst and deep romances that exist in the amazing world of books that I love. This is an incredibly quick read-maybe an hour or two if you have some time, I would recommend spending time with the characters in this book. It’s an extremely fast paced book that really ends up being a fortunate sequence of events. It’s a lot of intertwined characters, being related- but I really enjoyed every second. I think some may say the story is taboo, but it was done so tastefully, that it quickly became a great read. Tryst was a quick steamy read with characters that you will love. I liked that the tables were turned from the usual older man/younger woman romance. In Tryst, we get the opposite and it makes for a very entertaining read. If you have a couple of hours, grab a glass of wine and get cozy with this office romance. It's quick, enjoyable, a tad bit taboo, and I really enjoyed it. This was a spicy romance where Jade is 20, and her boss and dad's best friend is18 years older. The age difference is handled very well. Will a hot, summer fling be able to turn into any more? Where such a trust could have ended quite ugly and convoluted, Me Watson turned it into a lovely story of two people in love, despite any hindrance or complications. Highly recommended. This is the 1st book by Shaniel Watson that I have read and I really enjoyed it more than I thought I would!! This is a quick, fast paced read!! It's short and has a HEA so no cliffhangers which is a plus!! Younger woman older man that she has known her whole life!! If your looking for a short, steamy office romance this is the book for you!! My first book by this author. I really liked it. This was a super quick read. Its a forbidden love story of a boss and an intern. The book gets its steamy has a little bit of taboo. Also, it gets to the point of the story. If you need a quick read this is it! This is a quick and fast paced read, which is entertaining, and a steamy romance. I look forward to reading more of this authors’ work, and recommend her work for all readers. www.goodreads.comAuthorShan Shaniel Watson is the author of the Imperfections Series. Her first book was published in 2015. She writes stories she likes to read, sultry emotional stories with imperfect characters who eventually get their happy ending.